In back-to-back speeches, GOP presidential hopefuls U.S. Sen. Ted Cruz and real estate developer Donald Trump showcased their different campaigning styles as they rallied supporters against President Obama's Iran deal Wednesday. 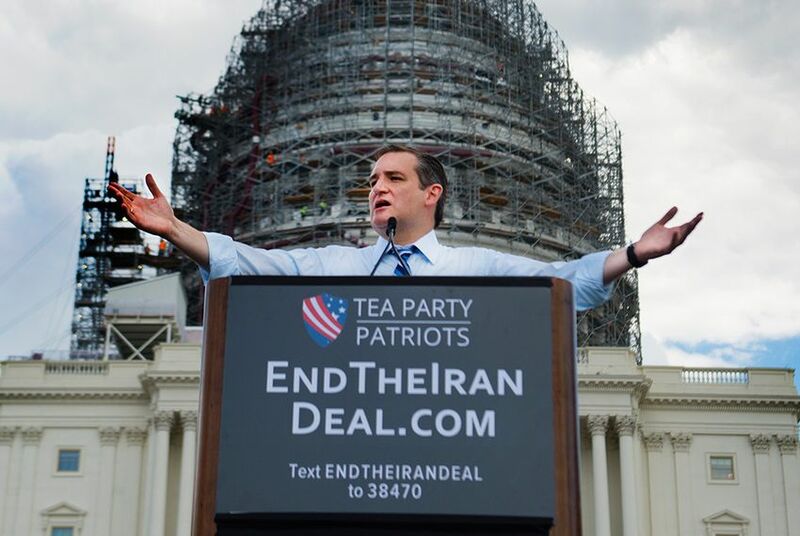 WASHINGTON — In back-to-back speeches in front of the nation's Capitol, GOP presidential hopefuls U.S. Sen. Ted Cruz and real estate developer Donald Trump showcased their different campaigning styles on Wednesday as they rallied supporters against President Obama's Iran deal. In legalistic and graphic detail, Cruz spoke twice as long as Trump about a deal that is, at this point, all but certain to hold up to Congressional challenges. Trump meanwhile offered that his force of personality and negotiating skills would translate to a "winning" foreign policy. The deal involves Iran and Britain, China, France, Germany, Russia and the United States. It aims to allow inspectors into Iran and limits the country's uranium enrichment in exchange for lifting economic sanctions. Republicans are universally opposed, but in the last 24 hours have publicly disagreed on how to tactically respond to Obama, who has sufficient Democratic Congressional support to uphold the agreement. "When we talk about terrorism, it's worth remembering that if this deal goes through, we know to an absolute certainty people will die," Cruz told the crowd, a respectable showing for a Wednesday afternoon although it did not overwhelm the Capitol's west lawn. "Americans will die. Israelis will die. Europeans will die." Argued that Senate Democrats who back the president on the deal will have blood on their hands, Cruz sounded dire warnings. "I want to ask every Senate Democrat, 'How will you look in the eyes of the mothers or father or sons or daughters of those who are murdered by jihadists, those Americans who were blown up, those Americans who were shot, those Americans who were killed, those Israelis who were murdered?" he asked. "And let me clear, if you vote to send billions of dollars to the jihadists who have pledged to murder Americans, then you bear direct responsibility for the murders carried out with the dollars you have given them.'" "You cannot wash your hands of that blood," he added. Referring to Obama as a "lawless president," Cruz reamed House and Senate GOP leadership for not employing various legislative tactics to stop the deal. Trump, on the other hand, argued that his business negotiating skills would translate into an improved American foreign policy. "We are led by very, very stupid people," Trump said. "We lose militarily. We can't beat ISIS. Give me a break. We can't beat anybody. Our vets are being treated horribly. "We will have so much winning if I get elected that you may get bored with winning. Believe me. I agree. You’ll never get bored with winning." Mostly Jewish and Tea Party activists, the crowd brandished signs including loaded terminology, accusing both Republican and Democratic lawmakers of being traitors. There is much intrigue about the relationship between the two presidential candidates, who referred to each other by first name at points in the steamy, Washington afternoon. Unlike his fellow Texan and fierce Trump critic former Gov. Rick Perry, Cruz's aim is to court Trump's large following. "I think Donald Trump has been tremendously beneficial to our campaign," Cruz told reporters after the speech. "Donald has an incredible ability to attract attention. Twenty-four million Americans watched that first debate." "Now coming out of that debate, most of the other Republican candidates, their numbers either stagnated or went down," he added. "Our national support doubled and I'm very grateful to Donald for millions of extra people, millions of eyeballs, watching that debate and having the opportunity to hear my positive, optimistic, hopeful conservative message."